The PlayStation 3 Play Create Share initiative takes to the streets with ModNation Racers, the urban vinyl-fueled kart racer from United Front Games. Let's take it for a spin. 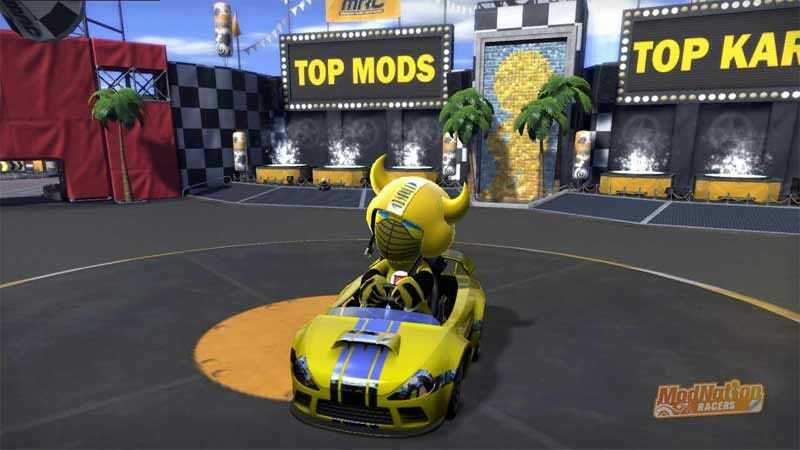 ModNation Racer takes the same creative spirit found in the PlayStation 3's LittleBigPlanet and applies it to the kart racing genre, providing players with the tools to create their own racers, karts, and tracks, sharing them online with friends around the world. United Front meets the cuteness of LittleBigPlanet's Sackboy with a dose of urban vinyl, the custom action figure sensation that made toy collecting hip again. Since the game debuted last year, I've had only one fear: would all of this creativity cause the developers to lose sight of the core racing game lurking beneath all of the custom parts? Let's see how things go down where the vinyl meets the road. Creationism: In the beginning, there was a blank vinyl figure and a bare racing kart frame. Sprucing those up and making them your own is where a good 75% of the fun lies in ModNation Racers. The key to the success of the creation tools in the game is that they are accessible to players of all levels of creative talent and patience. You can simply hit one button to randomly generate your racer and kart, skim the surface by utilizing a large selection of pre-made parts, or go deep, creating custom, multi-layered sticker applications, fiddling with material properties and transparencies, copying, pasting, and resizing until you come up with a look that other players will drool over. It took me about 45 minutes to come up with the rudimentary Bumblebee at the top of this post, and that was only my first attempt. Making Tracks: While I've already covered creating racers and karts, the ModNation Racers track editor is an amazing accomplishment that deserves special attention. It's one thing to slap some decals on a vinyl figure, or pile parts onto a kart frame. Creating a professional-looking race track that you and your PlayStation Network friends can race on in under 10 minutes is another thing entirely. Like the other creation modes, the track editor is as shallow or deep as you want it. You can drive the track creation tool around in a circle, let the game auto-populate it with hazards, scenery, and power-ups, and be testing it online in no time flat. Or you can painstakingly control every aspect of creation, setting each track object into place one at a time. At any point during editing you can drop into your track and give it a test drive with the press of a button. It's one of the most powerful editing tools ever made available in a console title, yet so easy a child could use it. Sharing Is Caring: What good is spending hours working on your custom racer if no one sees it? Once you've finished creating your epic Iron Man racer (one of the three currently highlighted "Top Mods" in the game's online hub), you can publish it for the world to see. Not only can they see it, they can download it and tweak it as well, if you allow them, making the in-game share station an excellent place for the not-so-creative to steal ideas. The more you create and share, the more creation experience points you earn, securing you a higher spot on the creation leaderboards. It's creative and competitive! Playing Other Humans: We've covered creating and sharing, now let's take a look at playing, specifically playing online against human opponents. I'm singling out humans both because of my personal bias, and the fact that it's against other living, breathing people that the racing in ModNation truly shines. After some initial connection issues that seem to have been cleared up, I've had no trouble connecting with other players, though many seem to be avoiding the official XP racing tracks in favor of trying out their custom creations in casual mode. The game plays a great deal like Sega All-Stars Racing, with a strong focus on drifting, the key way to earn the boost needed to pass the competition. The action is tight and satisfying, but the real joy lies in exploring other players' tracks with a group of other humans. With new tracks popping up every minute, a fresh experience is always right around the corner, along with a bunch of folks to share it with. Powering Up Power-Ups: There are only four power-ups in ModNation Racers. That might seem like a very low number, considering the myriad ways to knock off other players in other popular kart racing games, but the low number is made up for by the ability to stack each of the four up to three times, increasing the power with each additional pickup you make. The missile power-up, for instance, starts off with one measly rocket, but powering it up unleashes an impressive barrage that can easily clear the field of the competition. Should you immediately use the quick boost of a single speed power-up, or hold out for a triple stack, which actually warps you further up the track? Stacking adds a nice little element of strategy to races, without overwhelming players with a confusing array of different abilities. The Single Player Career Mode Hurts: It may not be rubber banding, but it sure feels like it. While racing against other players is a delight, racing against the AI in career mode is sheer punishment. While the first few races are relatively easy, by the time you make it into the third championship you'll be cursing the programmers responsible for giving artificial life to your opponents. The AI is ridiculously aggressive, programmed to keep up with you by any means possible. They stack their power-ups, just like a human player might, unleashing them with uncanny accuracy whenever it seems like you might be pulling ahead of the pack. They are always right on your tail as well - I never once experienced what I'd call a comfortable lead. I suppose the brutality is meant to foster better driving on my part, but more often than not, winning a career mode race felt like I'd lucked out, rather than performed to my fullest. I'd suggest skipping the career mode entirely, if not for the fact that many of the game's best unlockable parts are won by completing career mode challenges. Hauling Heavy Load Times: In a game that constantly has to stream custom-created content from different users to your console, one expects the load times to be on the high side, but this seems a bit excessive. Upon first entering the game's central hub during my first play session, I waited for over a minute at one loading screen. That's an extreme example that hasn't happened since, but 30-45 second loads are a regular occurrence. ModNation Racers is certainly a worthy follow-up to LittleBigPlanet as part of Sony's Play Create Share initiative. While it might not have the unstoppable charm of Sackboy on its side, it easily surpasses Media Molecule's game in terms of accessibility. It's so easy to create in ModNation Racers it's silly, but that ease comes at the price of variety. You can spend hours and hours creating custom content to your heart's content, but in the end, you're just kart racing. If that's okay by you, then that's okay by me. ModNation Racers was developed by United Front Games and published by Sony for the PlayStation 3 and PSP on June 25. Retails for $59.99 USD ($29.99 PSP). A copy of the game was given to us by the publisher for reviewing purposes. Played through career mode and spent 10-15 hours creating racers, karts, and tracks. Played multiple online races against human opponents. Downloaded content from the sharing kiosk. Used a great deal of foul language.